The story begins with Cassia on her way to her Match Banquet. It is a banquet where Cassia will be given the perfect “match” for her to marry, have children and grow old with. The society in which Cassia lives tracks and nearly controls her every move, therefore they are the experts on who she statistically should be matched with. It comes as a surprise when Cassia is matched with her best friend and neighbor, Xander and she couldn’t be happier. However, when Cassia takes the time to view her microcard in order to learn more about Xander it is not his face that appears on the screen but another boy who lives on her street, a boy named Ky Markham. 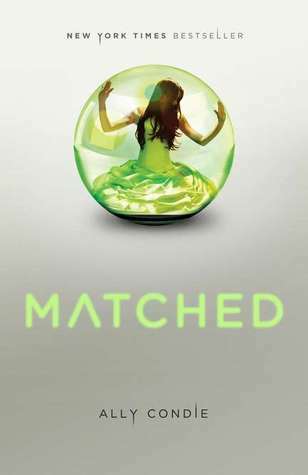 This so called glitch in the system begins to take over Cassia’s thoughts and she becomes obsessed with the idea that The Society made a mistake regarding her match. She soon begins to wonder if it is possible to be matched with two people and decides that she needs to find out more about Ky before deciding whether or not Xander is right for her. First, the narrative was absolutely gorgeous and I fell in love with Ally Condie’s writing style immediately. It is beautiful and strong and just resonating in a way that a lot of young adult novels are not. I loved the way in which Cassia starts off as a character who is naïve and young and excited to learn about who her match will be because it is a moment she has been waiting for all her life and then grows into an intelligent and strong individual who takes risks to save those that she loves. I immediately fell in love with Ky and really couldn’t stand Xander almost as soon as he was introduced. Ky had all of the qualities I love in a male character. He was smart (he taught her how to WRITE!! ), stubborn and stealthy and brooding and I just loved it. I felt sad for him and elated when his story was told in small ways and really couldn’t help understanding how Cassia fell in love with him. I am going to ignore the fact that she may have never glanced his way had she not seen his face pop up on her screen alluding that he was her match because that would ruin it and make me rather frustrated with the whole novel. Now I know many people have a hard time deciding between Gale and Peeta Ky and Xander but I really didn’t. Xander grew on me as the book went on but in the beginning I didn’t like him much. He seemed perfect but not in a good way, in a way that made me think that the society had molded him to be just what they wanted him to be. Finally near the end he has some acts of bravery where he takes a few risks and I cut him some slack but overall his character was flat and a little annoying. I was impressed at how present Cassia’s parents were since that is an element left out of many YA books and it really made me feel good to see their inner strength and knowledge in light of the society in which they live. Though this wasn’t my favorite read of the year I have managed to host two teen book clubs on it and the kids absolutely adored the book and couldn’t say enough about it, no seriously we ran out of time before we ran out of topics! I am pretty excited to read Crossed, which I just picked up from the library and will surely be reading the trilogy’s conclusion, Reached, when it hits the shelves on November 13! This book is highly recommended to those who are looking for a dystopian romance. This entry was posted in Reviews, Young-Adult and tagged dystopia, romance. Bookmark the permalink. I'm so glad to hear that your book clubs for this one went so well! I think it's just so beautifully written. It's funny, I was 100% for Ky, until I read Crossed. Now I'm kind of leaning back toward Xander. But more than anything I kind of want Cassia to come into her own and be something without the boys. I looooved this one and I need to finish Crossed. I'm really looking forward to Reached.